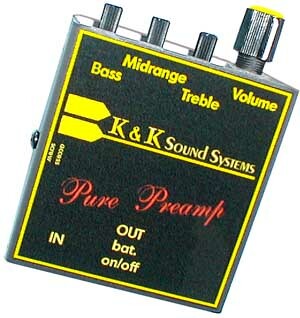 This time-proven outboard preamp features +/-20 db bass, mid, and treble controls plus an internal gain trimmer. The beltclip unit has been specifically designed for the frequencies of the acoustic guitar but it is also great for many other instruments. The Pure preamp features a special super wide band midrange filter, which is absolutely great in combination with the Pure pickups. It’s simple and noiseless circuit provides unsurpassed clarity and power and the internal gain trimmer allows you to dial in the precise amplification factor needed for your instrument. Frequency response is 10-30000Hz. The bass control is set to roll of at 100Hz, the midrange at 1.5kHz with extra large bandwidth and the treble are set at 10kHz.